The Baluchar cluster of villages in the Murshidabad district is the home of Bengali figured silks. These rival the slightly more popular Banarasi brocades, together with which these exquisiste silks form a staple of the Indian bridal trousseau. This gorgeous silk saree would be the perfect addition to one, what with the luxuriant coat of gold zari woven against the apt blush-pink of the dye of the base fabric. 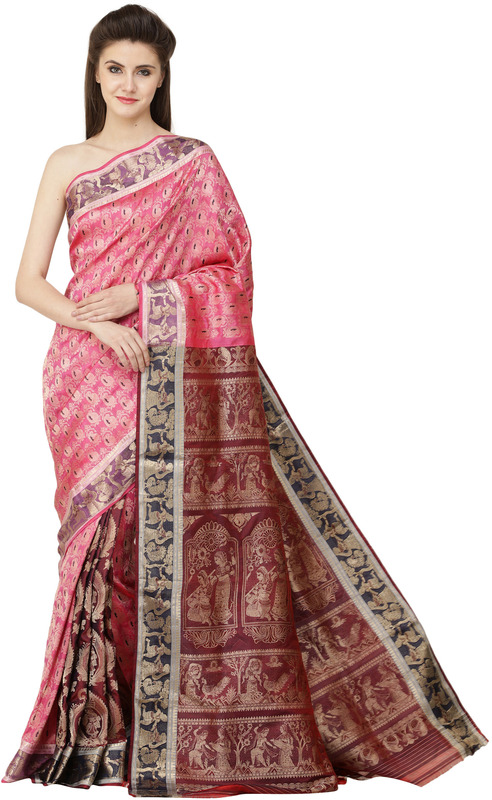 Both the zariworked paisleys and the miniscule surface areas of silk amidst them shimmer with the motions of the wearer. What makes this a true Baluchari number is the one-of-a-kind enpiece that, characteristically enough, tells a story. A purple border transitions into dark blue over the all-important pleats, then concludes in a statement maroon endpiece. Super-skilled zariwork on the border and the endpiece show moments of Radha-Krishna's togetherness, and Vrindavan gopies singing and dancing to the memory of their Krishna. Baluchari sarees have a history that goes back more than two centuries, probably all the way to the Middle Ages. The weaving techniques employed to produce these sarees, as well as the means of embroidery, are all possible on the Bengali drawloom to be found only in this region of Bengal. Having traditionally been worn during the autumnal Durgapuja festival, the collection of no saree-loving woman is complete without atleast one Baluchari. Pick this carefully handpicked number to go into yours for the superior quality of the silk and the lifelike appeal of the superimposed zari.